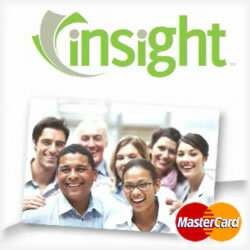 This week, we take a look at one of MasterCard’s new products, the Insight prepaid card. It’s not often a credit card company pays you to use its card, but with the MasterCard Insight, you’ll enjoy a $50 bonus on your first direct deposit of at least $200. That’s quite an incentive, especially when you consider everything else this credit card offers. Take a look. Users of this prepaid credit card will enjoy the versatility of a monthly fee or a pay as you go plan. This works great when budgeting each month what your expenses will be. All direct deposits are at no cost and there’s no application fees or other charges when you sign up. It’s a much safer alternative than using cash and for those who enjoy shopping online or the convenience of paying your bills online, this is the solution for you. For those who like to stay on top of their finances, you’ll appreciate the text alerts sent in real time. You know instantly anytime there’s any activity on your MasterCard account. No credit checks and no bank account requirements bring this offer full circle and presents an impressive offering. For quite some time, there has bee a new trend towards the consumer confidence in the financial sector as a whole. The credit card industry recognized this trend and to that end, they felt it was time to put the power back into the consumer’s hand. This is one reason the prepaid credit card avenues have proven so popular – the allow the card users to define their own parameters. Before long, though, the fees associated with many of those offers began adding up. The big credit card carriers, like MasterCard, knew the time had come to reshape their offers. This is one reason the new Insight pre paid credit card has been such a big hit. The lack of traditional fees has made it an instant hit with a contemporary society. Speaking of the contemporary consumer, you’ll enjoy the online management tools and the power of MasterCard. You can easily track purchases, ensure direct deposits and other deposits are appearing on your account in real time. MasterCard is global and for those who travel, this makes it a great choice. Unlike the traditional credit cards, the lack of interest rates allows you to save money each month, it’s a powerful financial tool that’s as part of your financial tool box as the cash in your pocket. For those who link their Insight MasterCard to their checking accounts, you can opt for overdraft protection as one more way to protect yourself. Mistakes occur and with this additional protection, you have no worries of overdrawn accounts. Of course, a checking or savings account isn’t required, but it’s handy to have if you do. Please note that the fees associated with your optional overdraft protection service is 0.15 (fifteen cents) for every dollar in negative balance. The maximum fee is $36.00. ATM withdrawal fees are $2.00 per, ATM inquiry fees are $1.00, card issuance fees are $9.95, cash loads at participating retailers is $5.00 and any over the counter cash withdrawals you make is calculated at 3%. Convenience transfer fees will vary – these are those fees associated with account to account transfers from other financial institutions or loan accounts. Lose your card or would like a second card? No problem. These fees are $9.95 and can be obtained by visiting your online account management site or by calling MasterCard. The entire fee schedule is available here. While there are no concerns over traditional fees and interest rates, you are backed by FDIC. This backing covers you for up to $250,000. This security is priceless in a world where credit card security is a top priority. You’ll flex your spending power with ease and confidence. Signing up is easy, too. Because there are no credit checks, there are no worries about being declined or receiving only partial approval. Provide your basic information, a few clicks, and you’re on your way to having one of the strongest financial logos in the world: the MasterCard symbols with Insight Prepaid MasterCard.